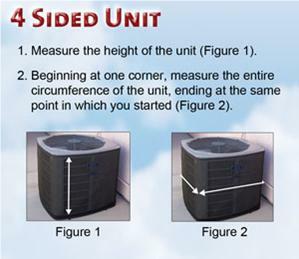 1) A/C Unit Style: 2 Sided3 Sided4 Sided 2) Height of Unit (Inches): 3) Circumference (Inches): 4) Did you add 2 inches to the circumference for 2 & 3 sided unit? : (Choose)"YesNoN/A : 4-Sided Unit This item is currently out of stock... Please contact us about backorders! A dirty A/C unit reduces air flow, impairs heat exchange and causes the compressor to needlessly run. This costs the homeowner money due to higher operating costs and shorter equipment life. 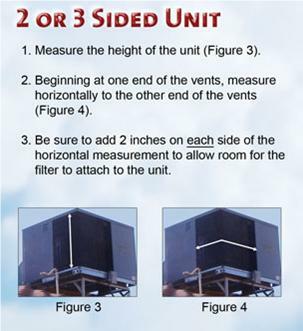 This wrap around air conditioner filter protects the A/C unit condenser coils from dirt, dust and other debris. 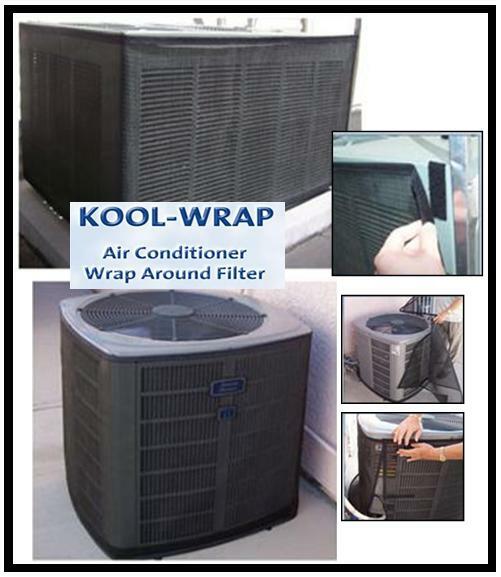 The Kool-Wrap helps keep the A/C unit clean to increase efficiency and reduce energy costs. To clean, simply remove the filter from the air conditioner unit and rinse with water opposite the direction of air flow. 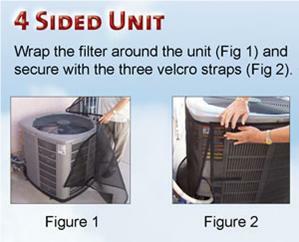 Allow to dry and place the filter back on the unit. 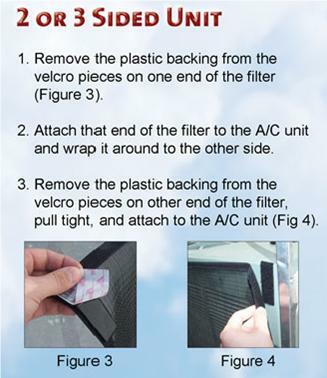 • Before installing the Kool-Wrap filter, thoroughly clean and dry the A/C unit. Failing to clean the unit before installing the Kool-Wrap will have a significant negative impact on filter performance. • We recommend that the Kool-Wrap filter be removed and cleaned every 30 days. • When cleaning the Kool-Wrap filter, flush with water in the opposite direction of airflow for best results. • Manufacturer’s Warranty: The Kool- Wrap filter is manufactured to withstand the outdoor elements and is guaranteed to last for the lifetime of the A/C unit on which it was originally installed. NOTE: Please double check your measurements as these filters are all made-to-order custom sizes cannot be returned if they are ordered wrong.